JMT’s work on the MD 195 bridge over Sligo Creek in Takoma Park, MD recently received a 2018 Bridge Design Award of Excellence from the Portland Cement Association (PCA) and Roads and Bridges magazine. The Sligo Creek project was one of eight national winners to receive an Award of Excellence. 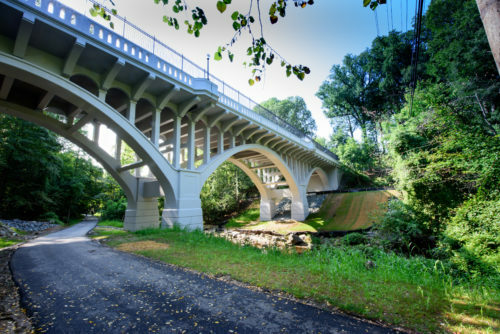 The MD 195 bridge, constructed in 1932, is a three-span, 224-foot-long structure spanning Sligo Creek Parkway, Sligo Creek, and the Sligo Creek Trail in Montgomery County. The Maryland State Highway Administration (SHA) determined that the open spandrel-reinforced concrete bridge required reconstruction, but reconstructed in place, 50 feet above a ravine, as the structure is historically eligible and a priority for preservation. It was crucial for the bridge to maintain its character, and therefore was reconstructed from the arch rings up.